Connor Wilkinson coped admirably with a full National League debut for Fylde and Matt Garrod and Richard Whiteside also came off the bench as the club focuses on the future in this season’s final handful of games. With Chris Johnson unlikely to play again this season because of facial damage and with Tom Morton also injured, Wilkinson made his first-team bow in the pivotal fly-half role alongside Greg Nicholls. An unfortunate day for injuries ensured the other two new boys were soon involved as well in the North-East. The visitors lost prop Simon Griffiths to a twisted ankle, Ralph Dowds to a dead leg and Nick Gray to a back injury. 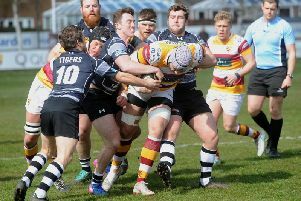 The injuries forced Fylde into some unlikely reshuffling, with back-rower Ben Vernon pressed into service on the wing and Oliver Brennand plugging the gap at full-back for the first time in his career. A determined DMP moved into a 19-7 half-time lead thanks to a hat-trick from Darren Fearn, who had crossed twice before Scott Rawlings scorerd the try which gave Fylde hope at the break. This was soon dashe as the hosts added converted tries through Tailiti Vaioletti, Jamie Barnard and Pete Homan to open up a 40-7 lead with 20 minutes left. It was to Fylde’s great credit that they scored the only try of the final quarter through replacement Phil Mills. Fylde: Bedlow; Bingham, Dowds, S Rawlings, Brennand; Wilkinson, Nicholls; Birchall, Loney, Griffiths, Gray, G Rawlings, Goodman, Vernon, Beaumont; Replacements: Lavelle, Mills, Stewart, Garrod, Whiteside.